For many years there was no rain or so little that even the morning dew seemed heavier and wetter than what the clouds could release. The water level in the boreholes sank lower and then dried up completely. The beest would go from pan to pan and find no water and they grew skinnier and eventually would succumb to the relentless heat and dryness. They tried to bring water in by lorries but after a while it became too costly to haul and they stopped and so the cattle died until there were only eight left of her over eight-hundred. We sat around the fire while the cook laid out slabs of game steaks on the braai. I listened politely to the conversation between Ursula, the mistress of the farm, and a pair of hunters from Port Elizabeth, Piet and Daniel. Ursula, who spoke mostly German all her life, was born on the farm and inherited it from her parents who moved back to Germany and remained there until they died of influenza. Her English, she apologized, was not very good, and so she mixed her conversing with a lot of Afrikaans and some English that she could muster from her limited experience in that language. The hunters could speak little German but were fluent in Afrikaans and English. And I, English was the only language I could speak or understand in this gathering where I felt so linguistically inadequate. Ursula, had been widowed for five years now, after her husband had been killed in a car accident. She was left to raise her two daughters and also manage the farm. The girls, still young, were attending boarding school in Windhoek at the exclusive Deutsche Hohere Privatschule and only return to the farm on holidays and school breaks, otherwise Ursala would live alone. The farm's employees lived in their quarters on the property a few hundred meters from the main house and guest facilities, tending the beests, the abattoir, and the seasonal tourist business that was Ursala started only after her husband's death. The disastrous dry years had passed and the years since brought enough rains during the summer months to bring the water level up and the cattle business prospered once again. The animals indigenous to the Kalahari savannah, the kudu, blesbok, oryx, duiker, ostrich, springbok, hartebeest, warthog, wildebeest, leopards, cheetahs, and caracals were not as affected as the cattle and had thrived in such number that Ursala had to call on Professional hunters from the conservancy farms to help her cull the wild animals. An overpopulation of any animal, wild or domesticated, meant an imbalance in the symbiotic relationship of life on her farm. She understood this very well, for she was as tied to the land as the beasts and plants and birds and reptiles and insects around her. Earlier that day, I had accompanied the two South African hunters and their PH to hunt wildebeest which were encroaching on the farm's cattle grazing land. Ursala rode in the back of another bakkie following us for she wanted to replenish her meat locker for her guests and workers. For that purpose, she did almost all of the hunting on her own farm. 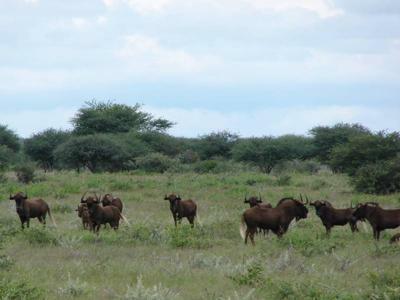 able to take fine Black Wildebeests with very little tracking after the shots. Happy with their trophies, the two hunters were taken back to the farm house to celebrate. Ursala asked me if I wanted to remain with her and the driver and tracker while she hunted for meat animals. I told her that I had inadvertently left my cameras in the other bakkie but she laughingly told me that she's not interested in having her photo taken. We left the vehicle and scrambled up a gentle koppie that gave us an overview of a pan. Indeed, when we got to the top, we saw a mixed group of about fifty animals 300 meters from us, wildebeest, blesbok, and springbok eating of the brosdoring and grasses of the veld or resting in the low shade of acacias and Shepherd trees. Carrying an unscoped 8x57 Mauser rifle, Ursala surveyed the animals, mentally sizing them and selecting which animal she would take. "Look at that big one over there", I whispered to her, pointing at a bull wildebeest that was displaying himself prominently before the ladies of his harem. "Not that one", she told me. "He's the baas and the cows need him to make more babies, strong babies." Without the aid of binoculars she focused on the young bulls that were hanging around the fringe of the herd. Apparently having made her selection she motioned for me and the tracker to follow her. We made our way through the hip-high driedoring but always keeping some higher brush between us and the wildebeest. A loud "bang", and then another took me by surprise. Almost without stopping her walk, Ursala had brought her rifle to her shoulder and in rapid succession brought down two young bulls that appeared out of the brush 40 meters in front of us. I almost did not see it happen... this huntress aiming, shooting, working the bolt, and shooting again with such efficiency. There was no need for follow up shots for the wildebeests went down within stone's throw of each other. I could not help but be awed by this splendid exhibition of shooting skill. In all my hunting years, I had never connected with a "double" on large game. Now, at the braai, we congratulated Piet and Daniel for their success with toasts of Schnappes. Talk was of that morning. They were reliving each second of their hunt, freezing in their minds forever those exhilirating moments. I, too, wanted to join in the conversation, to offer congratulations to the huntress Ursala but I did not want to detract from the moment that rightfully belonged to Piet and Daniel. "You have a wonderful place here, Ursala", said Daniel. "I wish I could trade places with you. Life must be good for you." "Good, now, yes", she said slowly, "but not always. For many years there was no rain..."
It was sobering to hear Ursala talk about the dry time, how she and her family had fought to work and keep the farm, of the tragedies in her life. "You are a strong woman, Ursala" said Piet. "If it were me I would have sold the farm and moved to Germany long ago." "No, here is mein farm" she said in a voice that I could barely hear. "My hart is tuis in Afrika. My heart is at home in Africa." This is a powerful story of a strong African woman. I hope you will submit other such stories for us to read. The author has a great gift. I FELT THIS STORY IN MY HEART. VERY GOOD STORY. A superbly crafted African story that grips the heart and may bring a tear to the eye. Thank you very much for submitting your wonderful story, Enrique. You are a wonderful writer and in my opinion, could very well have easily won the contest. I really enjoy reading your heart felt work.